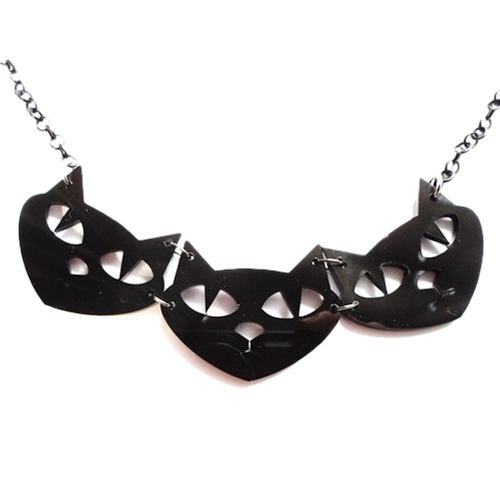 Three black cats, 3mm thick black acrylic on a trace chain. Measures a total of 18 inches. Check out the matching earrings! 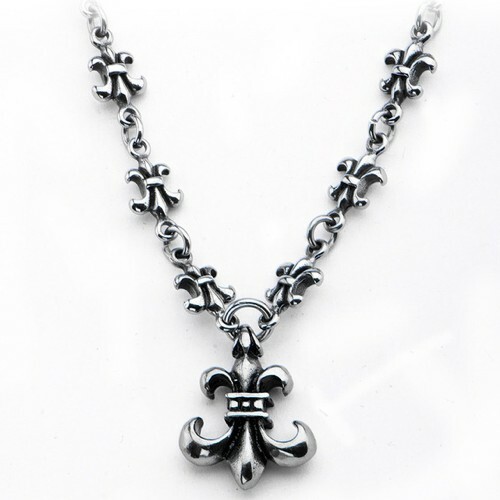 Stainless Steel Necklace with Fleur De Lis pendant on a fleur de lis chain. 18 inch long. 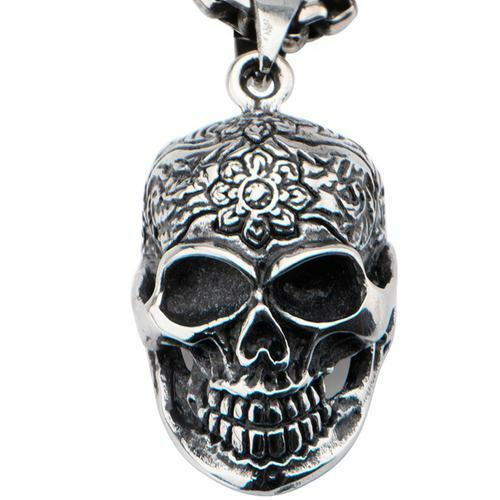 A stainless steel skull pendant with an ornate floral pattern on a fine rolo chain, 2mm thick and 16in long. A dedication to love, life or just ink? 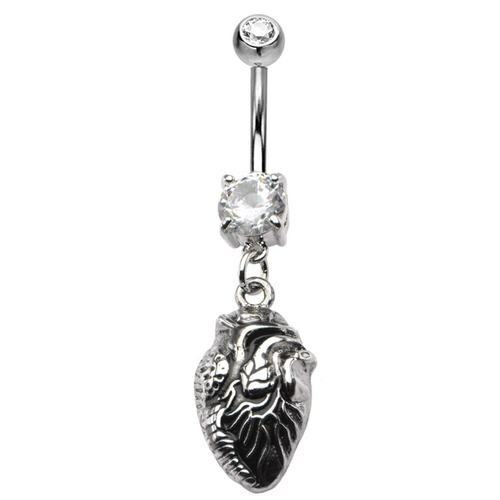 Swarovski crystal motor coils power the tattoo machine in hand; in dead hands... and inscribe their statement of eternity. 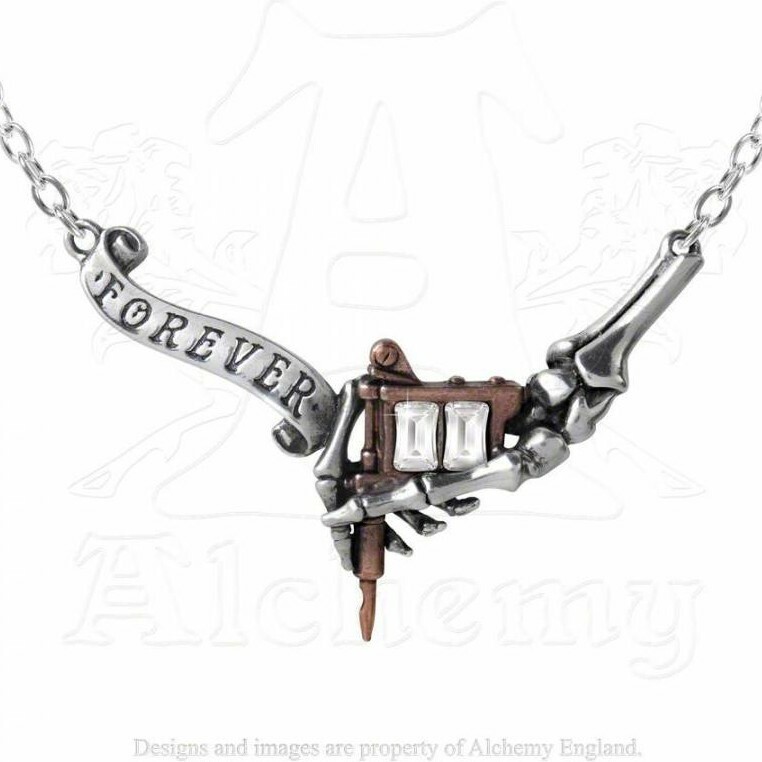 A two-tone pewter necklace of a bronzed tattoo machine set with two clear Swarovski crystals, held by a skeletal hand and with a scroll engraved "Forever". 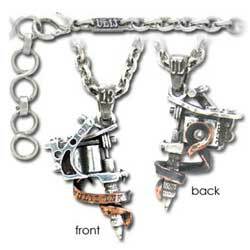 On a split, 18" trace chain with adjustable fastener. 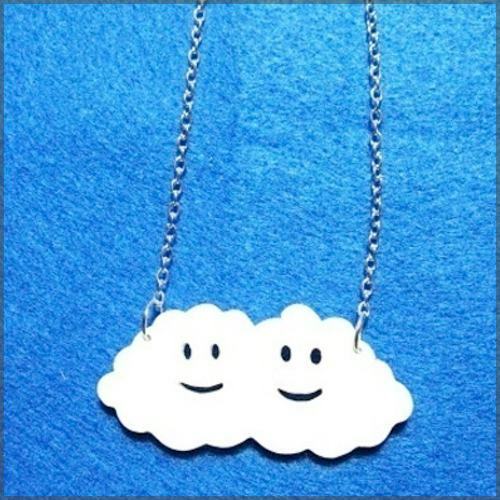 So cute, two merging happy clouds, smiling at the world. Cut from 3mm white acrylic and hanging from a 16 inch trace chain. Check out the matching earrings! 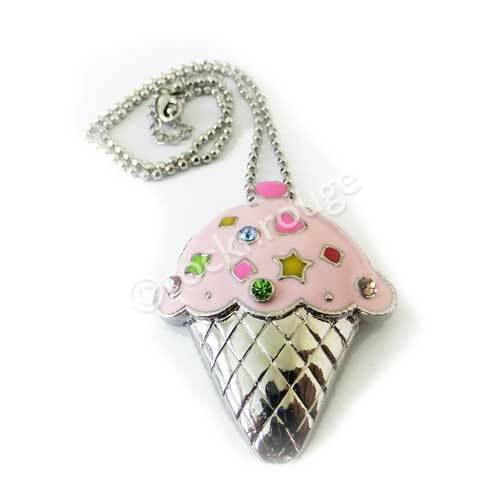 A delicious extra large ice cream pendant on a ball chain. Summery and cute! 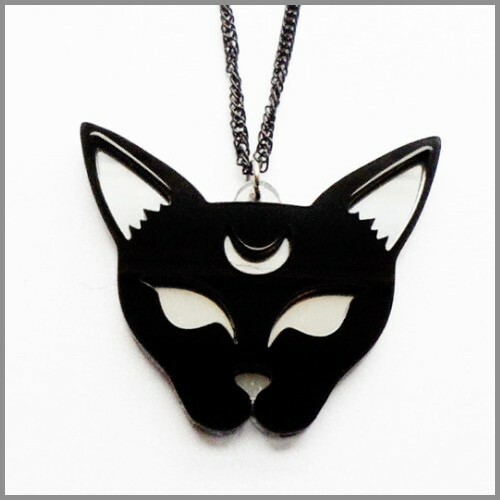 The black cat design has been layered onto acrylic mirror which glistens and shines in the light adding a touch of glam to any outfit. The cat measures 5.5cm and is suspended from an allergy free black plated chain of 18inches. 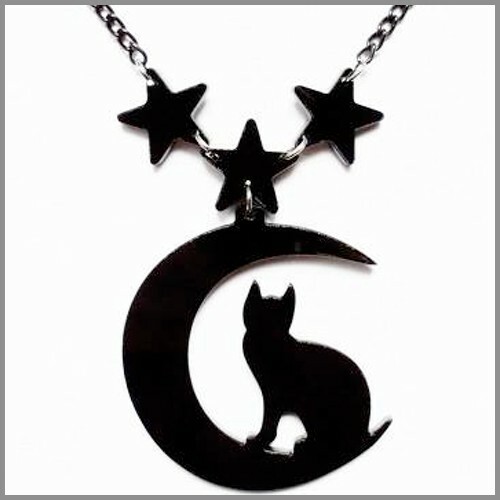 This moon gazing cat and star charm is suspended from a black plated allergy-free chain. Matching earrings available. 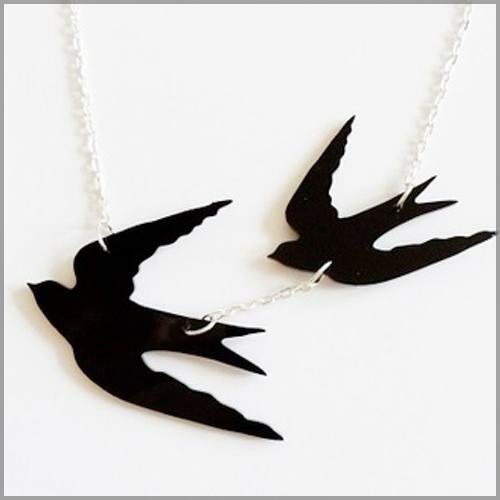 A pair of swallows in flights. On a silver trace chain measuring a total of 18 inches. A piece inspired by Poe's The Raven. 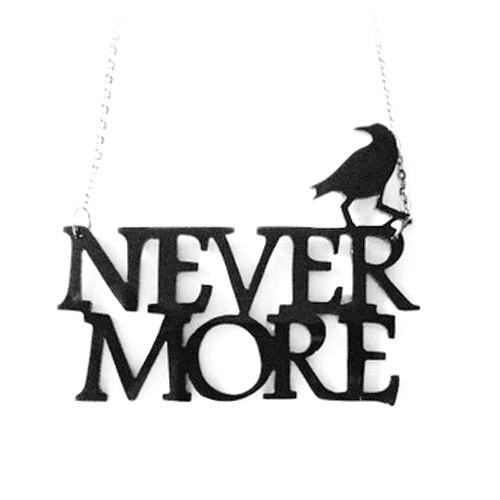 The words never more, cut through 3mm black acrylic, with a raven perched on top. 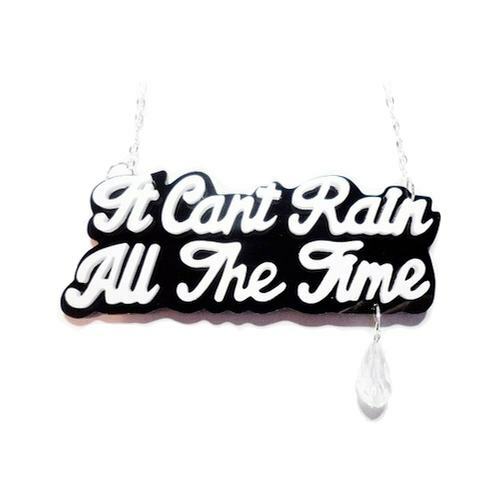 On a black trace chain, the necklace measures 18 inches. 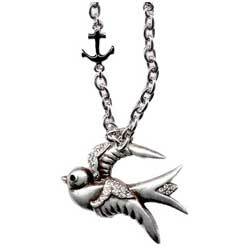 The pendant measures approximately 8cm wide x 6cm tall. 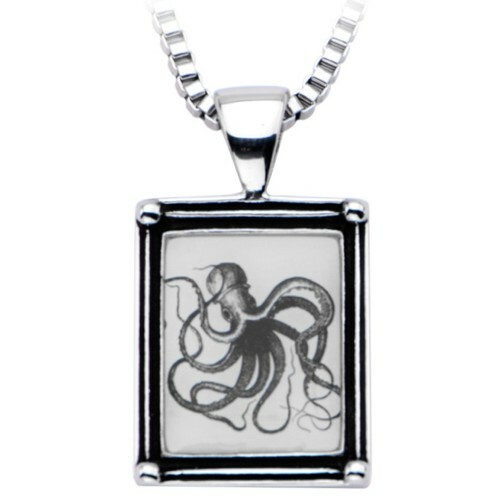 Stainless Steel Necklace with Octopus Vintage Frame Pendant on an 18 inch long chain with 2 inch extender. 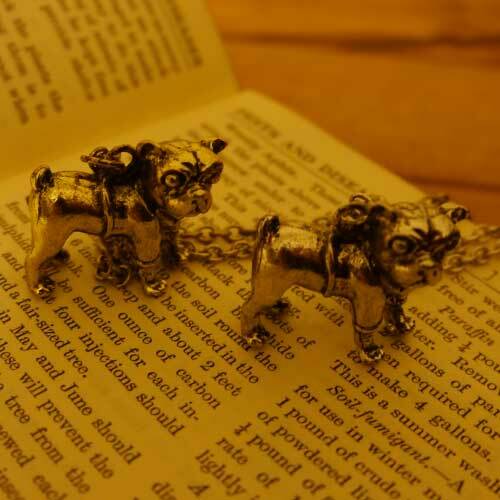 Totally adorable little pug, hanging from a long chain. Available in antique silver finish or weathered brass tone. 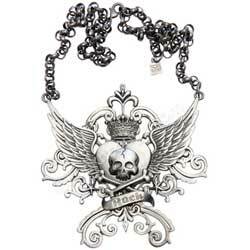 A killer necklace to add some pop to your rocker look. Measures 4" across, hangs 18" and can be adjusted. Nickel and Lead free. Was £55 - Save £15! 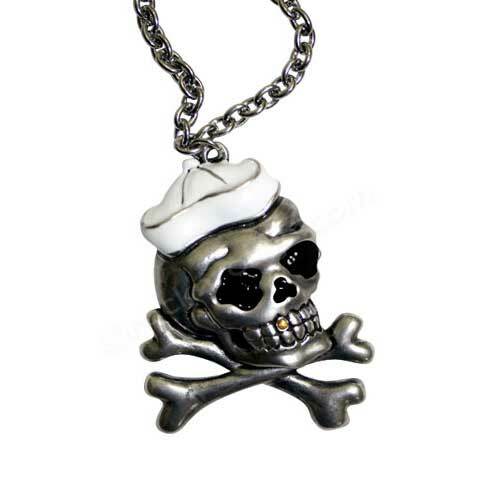 Adjustable Silver sailor skull and crossbones with white enamel sailor cap and gold rhinestone tooth. 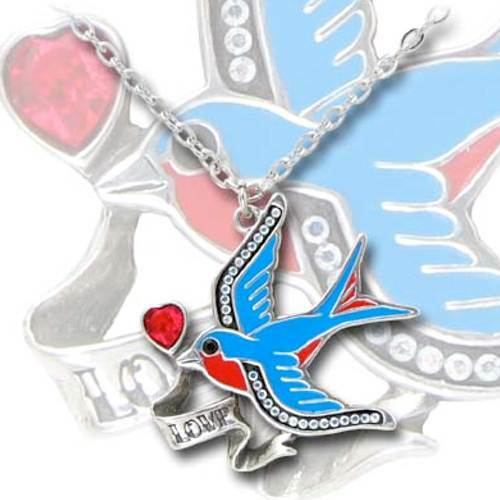 Two colour enamelled Swallow pendant with Swarovski crystal heart, crystal 'strings' & etched "LOVE" scroll. 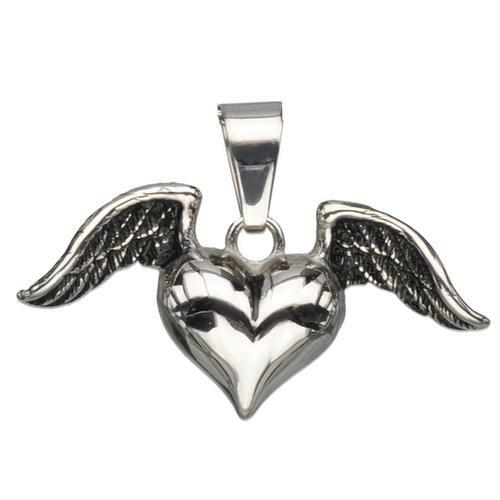 A small stainless steel winged heart. Measures 15/16 in high and 1 3/8 in wide. 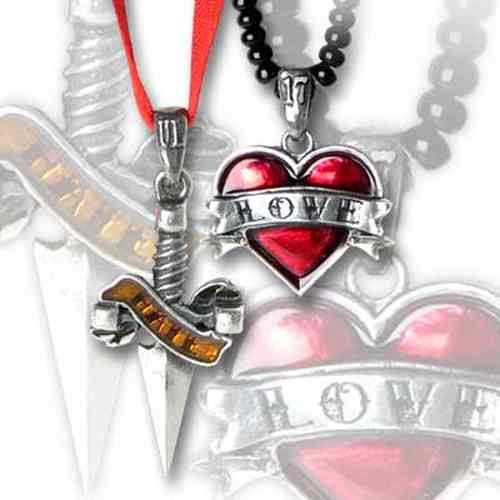 You can have the pendant on its own, on your choice of leather thong or vegan-friendly faux suede choker with screw barrel clasp.